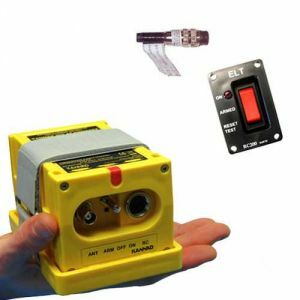 Kannad 406 AF-COMPACT is designed for private pilots and all light aircraft requiring one compact automatically activated upon impact ELTrichiedono ELT, which sock absorber will set the device to on in case of crash. Pilot also can manually activate the ELT in case of emergency. This new generation ELT brings al the COSPAR-SARSAT system improvements on at a competitive cost. Main features includes: two-ways control, thanks to RC102 remote, with adaptable mount bar and inner batteries instead of outer power source. Inner buzzer and shock absorber. Optional features including: Rc102 double cabled, aircraft pre-programmed indentifier, ideal for fleets, adaptable mounting bar beacon, RC200 control panel and connectors.